Halli Wall (22) and Brittney Wilson (5) go for the block for Washington in a Frontier Athletic Conference match against visiting Chillicothe Thursday, Aug. 30, 2018. The Washington Lady Blue Lion volleyball team pushed defending Frontier Athletic Conference champions Chillicothe to the brink Thursday night at Washington High School. 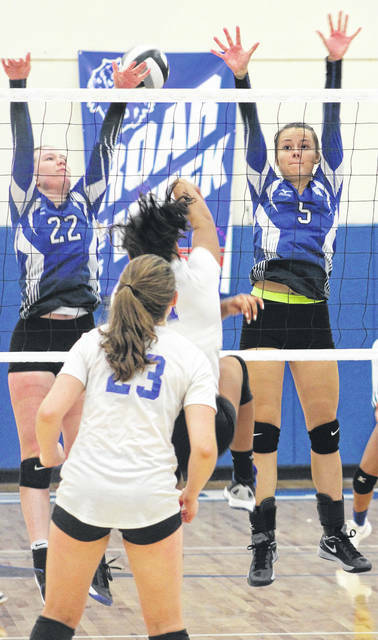 The match went five sets before Chillicothe pulled out the victory. Scores of the sets were: 20-25, 25-12, 26-24, 30-32 and 15-8. “I thought we did a really good job putting a lot of pressure on Chillicothe,” Washington head coach Ashley DeAtley said. “They’ve got those good hitters that we try and prepare for as much as possible. “Our girls did a nice job of defending and attacking at crucial times,” DeAtley said. “However, I felt like we had a let-up after the fourth game. “We talked about that and we know what we have to do next time and how we’re going to set up for the rest of the season,” DeAtley said. Statistically for Washington, Rayana Burns had six ace serves; Hannah Haithcock had four aces and Halli Wall had four aces. Haithcock led the team with 15 kills; Burns had eight kills and Brittney Wilson had five kills. Wall had 33 set assists; Aaralyne Estep had 16 digs, Mackenzie Truex and Wall both had seven digs. Washington is now 1-1 in the FAC, 3-2 overall after a 3-0 win at Hillsboro Tuesday, Aug. 28. Washington is at Unioto Saturday for a tournament and back at home Wednesday to take on Madison Plains, beginning at 5:30 p.m.